Join Rover.com - The Dog People, for an evening of dogs, beer, cheer and trivia at Black Lab Brewing. 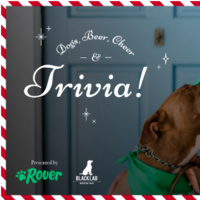 Bringing together Torontonians and their furry-friends, Rover will host both human and dog trivia lovers at Black Lab Brewing for an evening of friendly competition, a special edition food pop-up and prizes so good you won’t want to re-gift them! For one night only, all guests in attendance will be able to taste Rover's limited edition brew "Rover’s Four Lagered Friend." Off Leash Studio will also be onsite to take custom holiday portraits of you and your four-legged friends. Hotmail is the second most used emailing service behind Google’s Gmail, with more than half a billion users worldwide.